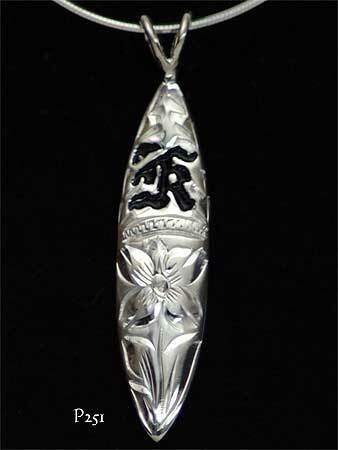 Sterling silver Hawaiian jewelry design unisex surfboard pendant. Features hand carved Hawaiian Plumeria (frangipani) flower and leaves scrolling work, highly polished. Also a black enamel �K� inlay, this stands for Kuuipo � Hawaiian for love. The reverse side is highly polished and with hallmark. Other colours available are blue or pink. Can also be purchased without the �K�. Measurements: 43mm drop, 10mm at widest. 5.10 grams weight. The loops take up to 2.50mm diameter chain.